Where is the Statue of David? Home Florence	Where is the Statue of David? 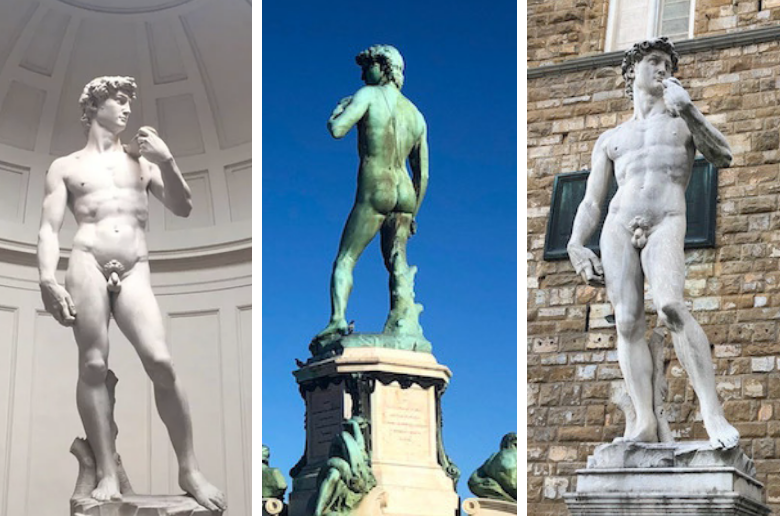 After 500 years, Michelangelo’s David is still prominently recognized as a masterpiece propelling the evolution of Renaissance art in Florence. But what isn’t quite as recognizable is the original version of the David. Currently, there are three statues of David—one authentic and two replicas—that maintain Michelangelo’s visionary sculpting. In this guide, you’ll learn about the significance of the statue and its three locations in Florence. The Statue of David is one of the most celebrated artworks in the world, let alone in Florence. While joining us on our skip the line Florence tours, be sure to check out our selection of tours that visit the David. Our Michelangelo’s David and Florence Duomo with Dome Climb is a great way to explore Michelangelo’s David as well as the interior of the Florence Duomo. 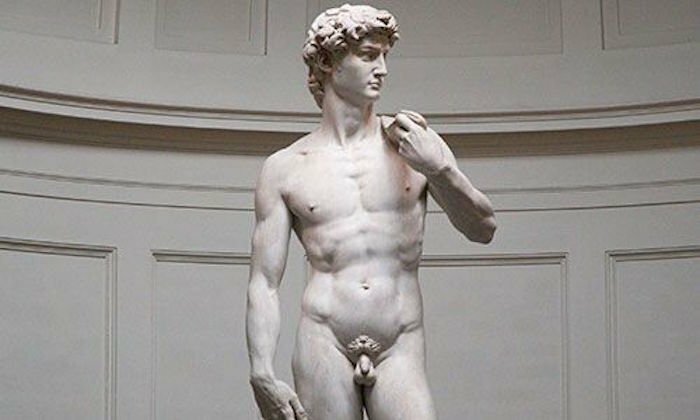 Want to see the David, but you’re staying in Rome? Our Florence in a Day Tour from Rome with David and Duomo provides the best of Florence with round-trip transportation included. As the Biblical tale recalls, David’s story is one of courage, wisdom and unforeseen strength. At the time, the Israelites’ relentless enemy, Goliath the giant, was threatening the safety and security of the Israelites. For many days, Goliath pestered the Israelites to conduct a fight—one that would bestow power to the winner. It was only until David used his wit and connection with God to fight Goliath that the Israelites were free of the Philistines’ threats. In the end, David ascended as the hero. In Florence, David is an artistic icon of hope. During the 1400s, Florence’s wealth and status materialized. Artistry, textiles, banking and the beginning of Renaissance culture promoted the growth of Florence’s prosperity. The establishment of new techniques in art, architecture and economics allowed the city to compete equally with nearby cities, such as Rome. In this way, David became a symbol for the city. Although the city began as a weak competitor, it quickly became strong and surpassed the capacity of business in other areas, just as David grew strength when defeating the giant. Because religion was central to all facets of life, David represented the religious ties between the city and God. During the 1400s, Andrea del Verrocchio and Donatello portrayed David in their own statues, but Michelangelo’s raw interpretation depicted the humanization of David’s conscious thought—a concept that birthed a Renaissance era. Unlike other artists who sculpted David after his triumph over Goliath, Michelangelo’s statue told a more in-depth narrative. He positioned the story before the battle with Goliath, which emphasized David’s imperative choice regarding his own actions. So, where is the Statue of David? 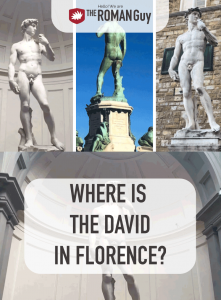 There are three Statues of David roaming around the city of Florence. Think you’ve found the real one? 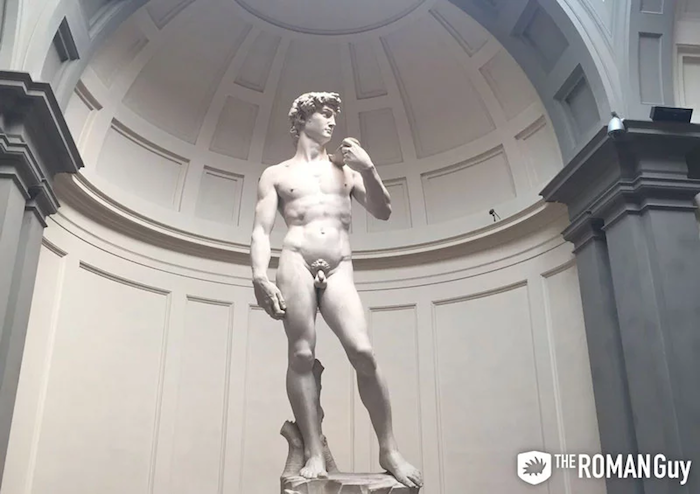 The colossal and authentic 17-foot-tall Statue of David is currently located in the Accademia Gallery, though its original home was the Piazza della Signoria. When the Opera del Duomo first commissioned the statue, its location was intended for the Cathedral of Florence. The project began by Agostino di Duccio and Antonio Rossellino in 1464 and 1475 respectively; however, neither sculptor could curve the marble due to its substantial size. Michelangelo, willing to complete the challenge, began the project in 1501 and ended in 1504. The only problem: the size of the finished product. Imagine a 17-foot-tall statue situated on an elevated surface in the Cathedral—the intricacy of the detailing would have been lost. Therefore, a committee met to approve the Piazza della Signoria as the permanent home of the statue. Or so they thought. In 1873, the statue was moved to the Accademia Gallery after experiencing weather damage. The Accademia Gallery has preserved the Statue of David ever since. The Statue of David in this location is in fact a replica, though its resemblance to the original statue is uncanny to most travelers who pass by the square. In 1910, the replica was created to replace the original statue that had been moved into the Accademia Gallery. The L-shaped square—one of the most famous in the city— houses many significant Renaissance structures in Florence. The square is situated between the Duomo and the Arno River, which is directly in the center of the city. This has increased the volume of travelers touring the area. The replica stands adjacent to other statues from Renaissance sculptors including Benvenuto Cellini, Giambologna, Fancelli and Vacca. 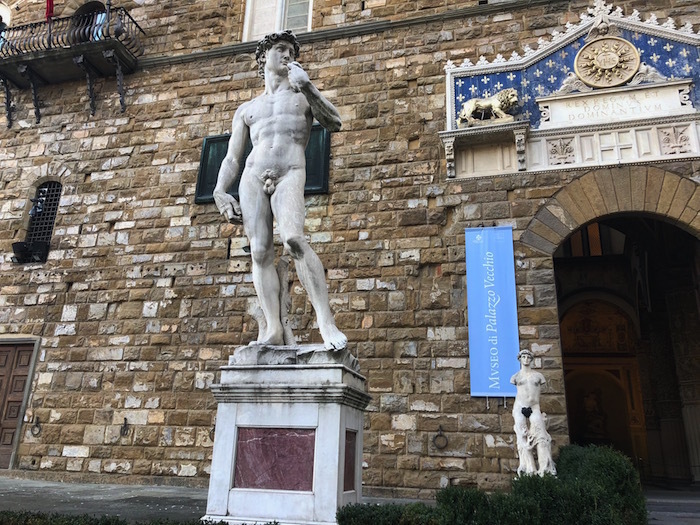 Although the original Statue of David lies in the Accademia Gallery, the Piazza della Signoria is a must-see for anyone hoping to gain more insight on the political, economic and architectural history of Florence. 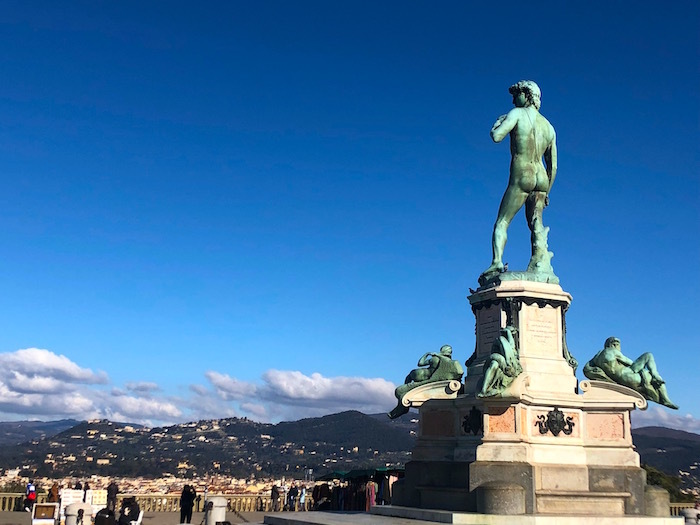 A third Statue of David, situated on the hillside at Piazzale Michelangelo, overlooks the breathtaking view of the city. In the 1860s, Guiseppe Poggi developed Piazzale Michelangelo and illustrated plans for a Michelangelo monument to hold replicas of his work. Because of the significance of the Statue of David, the city placed a replica on the monument’s base in 1873. The difference between this replica and the original David lies in the materials used. While Michelangelo employed white, simplistic marble for his original, the creators of the replica chose bronze to differentiate the two masterpieces. Today, the replica Statue of David remains central to Piazzale Michelangelo. While visitors absorb the city’s views and dine on exquisite cuisine at the top of the hill, the monumental Statue of David also greet them. There’s no better way to explore the city.